This collector design uses three layers of ordinary aluminum window (insect) screen l as the absorber. The air enters at the center bottom of the collector, where an aluminum baffle spreads the flow across the width of the collector on the glazing side of the screen absorber. The air rises up between the glazing and the absorber, and eventually finds its way through the three layers of screen absorber and flows to the back side of the collector. The air then flows up the back side of the collector to the exit vent located at the top of the collector. The design is similar to the vented aluminum soffit absorber collector, and uses pretty much the same collector geometry, but substitutes the three layers of window screen for the vented aluminum soffit as the absorber. NOTE: Some of the testing was done with this collector that has an absorber made from 3 layers of screen, but the screen collector used as the "reference" collector in the later part of the testing season used only 2 layers of screen. Back to the Solar Air Heating Collector test program home..
- Remove the aluminum soffit absorber, and substitute the 3 layers of screen that were spaced about 0.4 inches apart from each other. - Add about 1 inch to the collector depth to accommodate the thicker screen absorber. The screen absorber sits on the same supports that the soffit absorber was installed on -- so, the flow passages above and below the absorber are the same depth on the soffit collector and the screen collector. 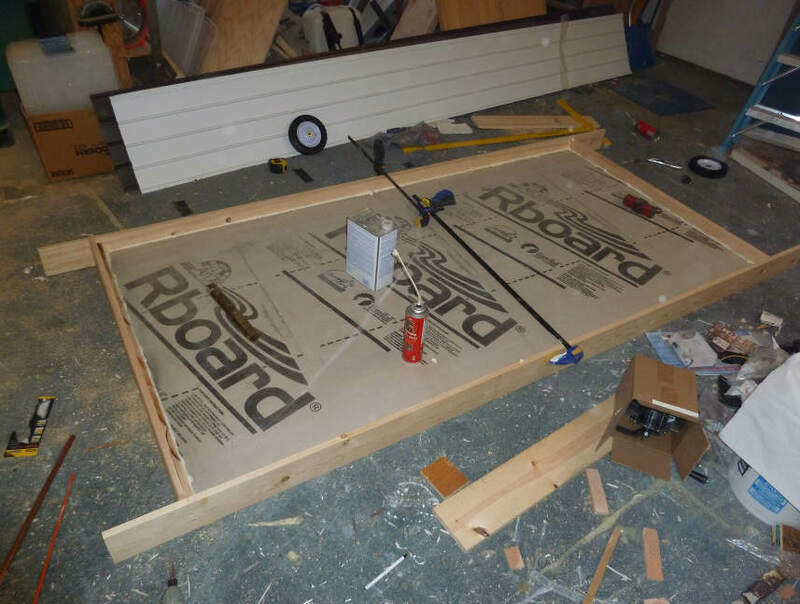 The first part of the construction is the same as the Reference collector -- I basically built a box with an insulation board back, 1 by 6 sides, and 2 by 6's for the top and bottom sills as shown just below. For the screen collector, you need the dimension from the back of the glazing to the bottom of the box to be about 5 inches. Since I was starting from the Soffit Collector collector, which was only about 4 inches deep, I added an inch of depth by gluing on one inch wide strips to the sides and top and ends. This extra inch just accommodates the thicker screen absorber -- the screen absorber sits on exactly the same absorber edge supports as the soffit absorber did. You can also see that the collector I started with had its vents on opposite corners, and since the screen and soffit collectors want vents on the centerline, I filled the old vent holes in with insulation plugs and Great Stuff, and cut new vent openings on the centerline. This is one of the new 6 inch diameter centerline vents. Shows the two new centerline vents and the two old vents before they were plugged. All the vents are foamed in place with Great Stuff to avoid leaks. The screen absorber is far from the glazing at the bottom of the collector (where air enters), and is close to the glazing at the top of the collector where air exits. The idea is that most of the flow is on the glazing side near the inlet end of the collector, and most of the flow is on the back side of the absorber near the outlet end of the collector, so sloping the absorber allows the depth of the flow path to match the flow rate. Three pieces of Charcoal aluminum insect screen for windows are cut out to just fit inside the box. The three pieces are spaced 3/8 inch from each other by wood spacers that make a sort of picture frame around the screen. So, the stack up from the bottom is: 1) window screen layer 1, 2) 3/8 inch spacer board, 3) window screen layer 2, 4) 3/8 inch spacer board, and 5) window screen layer 3 on top. Total thickness of the absorber assembly is close to an inch. (Note that for the two screen version, the stackup is the same except that the 3rd layer of screen is omitted). Cutting the screen to size. The screen is then just stapled to the edge frame. The finished 3 layer screen absorber. I supported all edges of the screen absorber with wooden strips as shown in the next pictures. These are the same strips that supported the soffit absorber. The absorber support strips being attached to the collector box sides. The depth from the top of the strip to the back of the box is 3 inches on the outlet end of collector, and half an inch near the bottom end of the collector. This means tapering the support strip down to half and inch on the inlet end. These pictures are from building the collector that uses aluminum soffit for the absorber, so you see pieces of soffit in the picture, but installing the vents is the same for the screen absorber collector. This half inch plywood spaces the bottom of the screen a bit off the bottom of the collector box, and provides a base to staple the screen to where the screen is penetrated by the inlet vent (see below). It is just held in place with Great Stuff foam. a knife is used to cut a hole in the screen for the inlet vent to come through. down on top of the screen. The inlet vent tabs screwed down into the underlying plywood strip and capturing the three layers of screen. absorber frame to the absorber support strips. The absorber assembly installed in the collector box. Install the baffle plate that spreads the flow from the inlet across the width of the collector. This is the same baffle plate that was used in the soffit collector. The purpose of the baffle is to spread the incoming air out over the full width of the collector and to keep the inlet air from impinging directly on the glazing (which would result in a lot of heat loss). Install the SunTuf glazing. Suntuf glazing is corrugated polycarbonate. It transmits 90% of sunlight, has a high temperature capability, and is very tough. Home Depot is one of the retailers that carry it. Be sure to install at least one glazing support bar to keep the glazing from buckling excessively as it heats. I used scrap copper pipe for the support in this case, but half inch galvanized EMT conduit is fine. Staple the close out strips to the box. same time insure a good tight seal between the glazing and the box. the glazing and the collector box. corrugations tightly into the foam closeout strips. I should point out that these are collectors I'm building only for test purposes. For permanent collectors, I'd give more thought to the life of the collector. Some people feel that wood should not be used in collectors as it may limit the life of the collector. I'm not so sure about this as my 6 year old large wood collector looks as good inside and out as the day it went up. It probably depends on your local climate, and the details of how the collector is mounted. I do think that using deck "wood" or PVC "wood" for the external batten strips that hold the glazing down is a good idea as the glazing batten strips take a lot of weather -- the 6 year old deck wood batten strips on my Solar shed collector are still like new. If you do use wood construction be sure to think about the details, don't let water penetrate the collector, be certain to prime and then follow with two coats of good exterior paint, and keep an eye on the collector for signs of needing maintenance over the years -- take care of it like you do your house. If you feel more comfortable with metal construction, then by all means build the collector from metal.